Hi friends! I hope you are all well and had a good weekend. We got quite a bit of snow and enjoyed being outdoors in the snow. On Thursday it was 18 degrees Celcius below zero, and sunny. I went for a walk along a stream and took some lovely frosty photos. I love the look of white branches on trees. 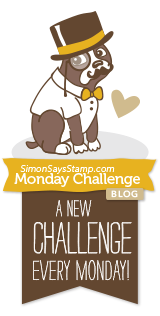 Today, it is Monday again and a new Simon Says Stamp Monday challenge, Stencil It. I love stencils, they are so versatile and can be used for many techniques. There are also so many fabulous designs available, and they even take very little space to store. 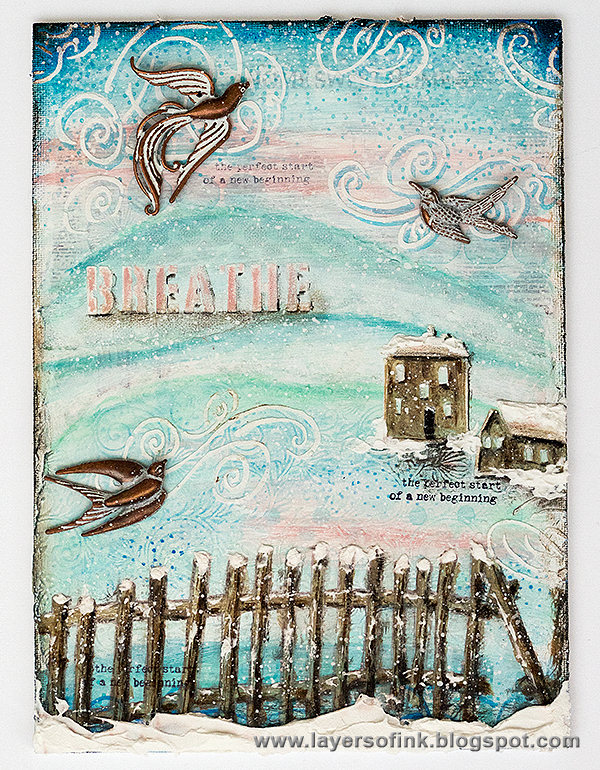 I started making this mixed media canvas on one of those very cold days last week, and was inspired by the gorgeous sky streaked with pink that I had seen in the morning. 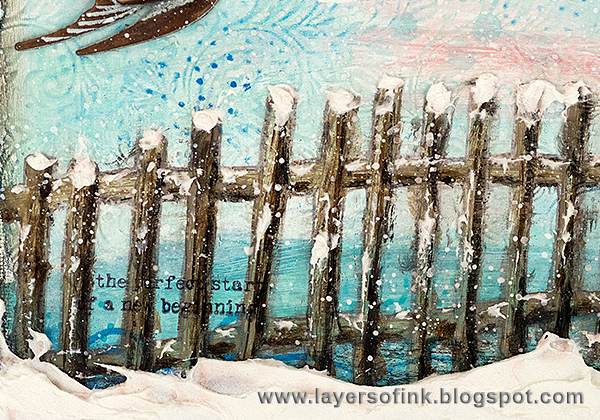 I imagined standing at an old wooden fence looking out over a frozen, but yet inviting, landscape. And maybe moving into the house with the old barn on the canvas. I used stencils by StencilGirl to create this. If you haven't had a look on their stencils, I hope you will do so, there is a wonderful variety and so much to choose from. 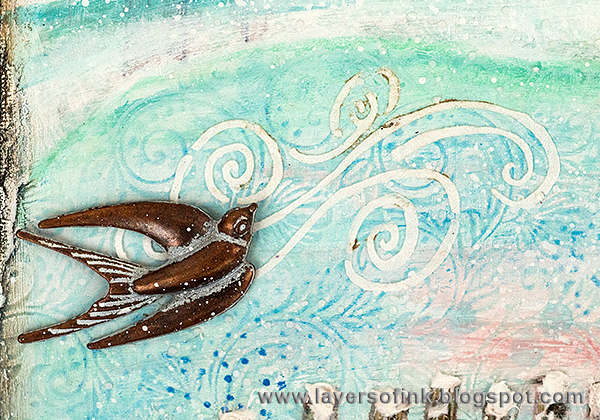 Working on a canvas and gesso covered wooden board (6.3 x 8.6 in), I tore a sky and hills out of paper from the Kaisercraft Blue Bay set. 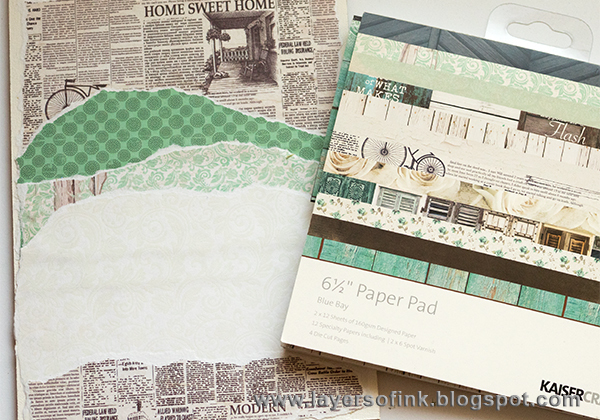 The dotted and white papers have a texture, which I thought would also work well on the canvas. Coat with gesso, but leave some of the pattern showing through. 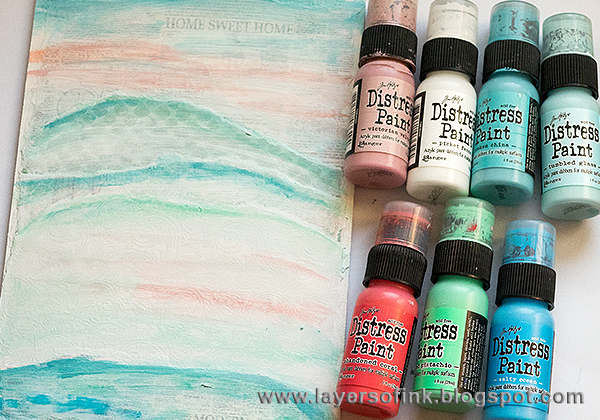 I painted the board with Distress Paints, watering them down slightly. The pink in the sky is repeated in the snow. 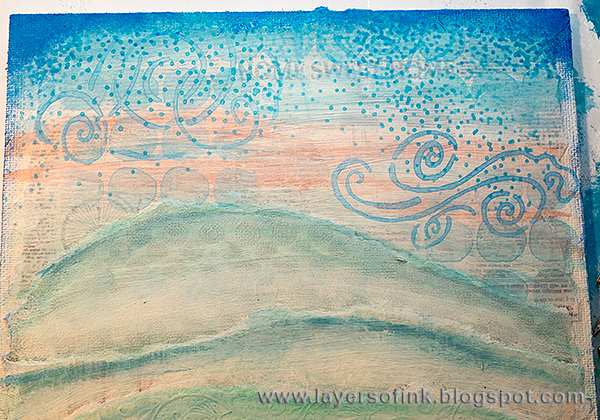 Texture was added with three different stencils: Circles Layer Me, Clouds, and Starlight Mini. I used the fun Ladders stencil by Carolyn Dube, but not for a ladder, but to make my fence. The stencil was traced with a Distress Marker. I didn't use a permanent marker, because I wanted the lines to disappear and knew the Distress Marker would react with and become a part of the paint. 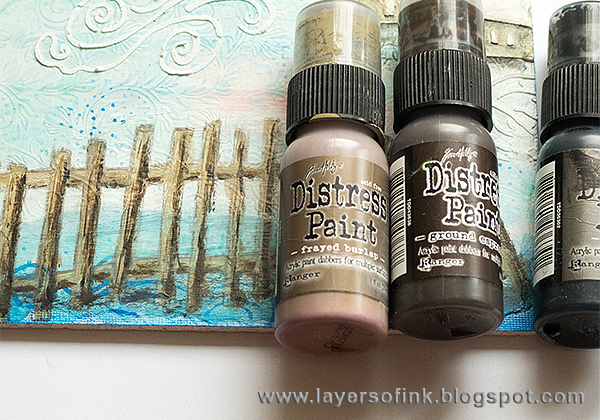 Paint the fence, first with Frayed Burlap, then adding shadows and texture with Ground Espresso and Black Soot. As you can see, the traced lines are now gone. The clouds were done first in blue and then with Texture Paste. 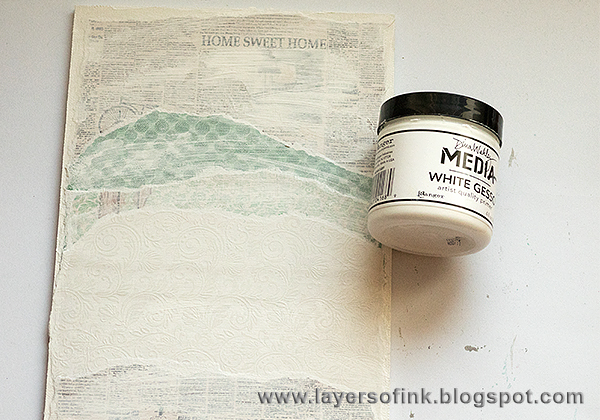 I mixed a tiny bit of white paint into the paste so that it would look whiter. 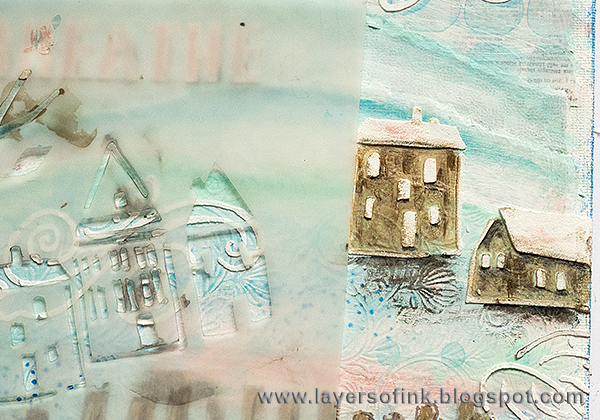 The houses were made with Texture Paste, using the City Stories stencil. When the paste was dry, I painted them with the same brows used in the fence and added shadows. 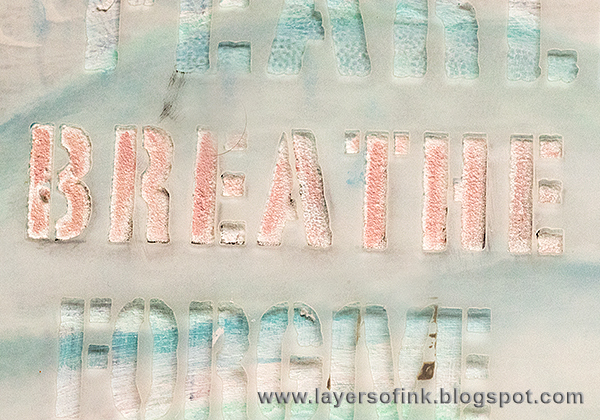 The title word was done with the Uplifting Words stencil and paste. I wanted the word to be light and blend into the background and painted it pink, instead of brown or black, which I might ordinarily have done. 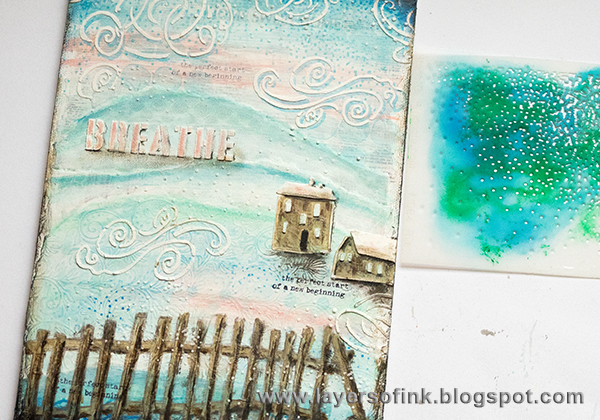 More snow was added with the Starlight Mini stencil and Texture Paste. 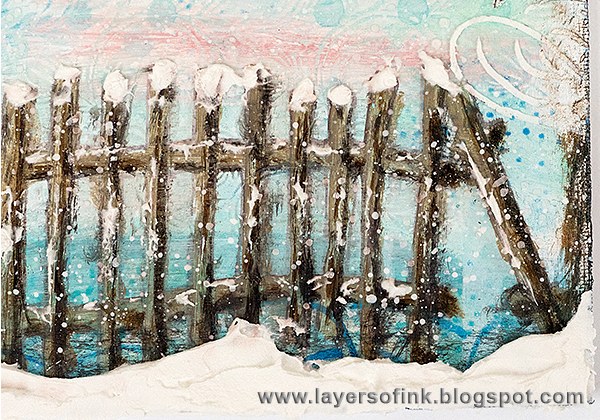 I applied more snow at the base of the fence, and to the fence posts, using a palette knife. 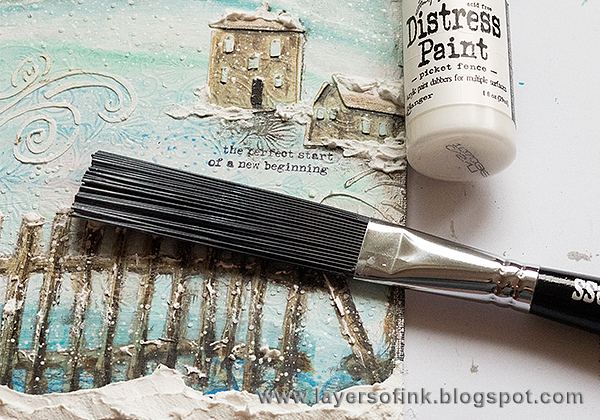 Finally, the canvas was splattered with white paint, using Ranger's new Distress Splatter Brush. It works really well. 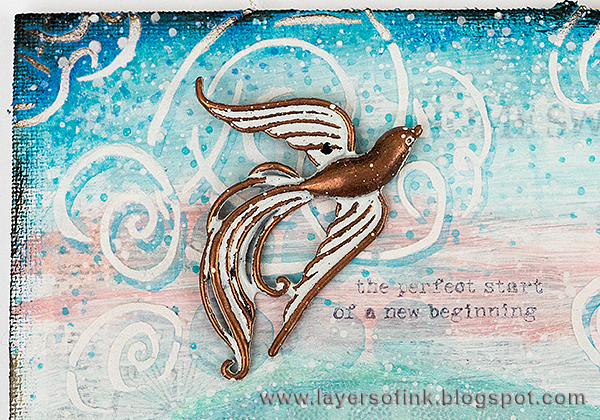 The gorgeous metallic bird embellishments come from Prima, and when I got them a few weeks ago, I knew I wanted to use them on a project where they would be clearly visible. Love them. There are two more in the pack which I will use another time. 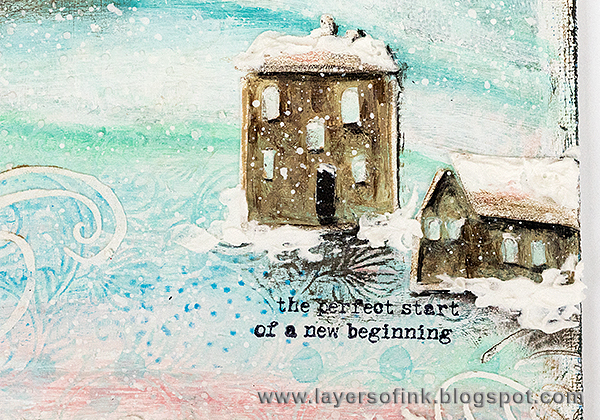 I used part of a stamp by Wendy Vecchi as a sentiment. I really like this stamp. It was stamped with Jet Black ink and I stamped it another two times on the board, without reinking. A shadow was given to the stenciled word to make it stand out a little from the background. Here you can clearly see the white splatters. Another of the pretty birds. I added one of the cloud shapes to the snow, because I thought it also looked like soft snow downs. When I traced the fence, I angled it for the last post and made it look like it was a little broken and worn out. I hope you will join us in our stencil it challenge. As always you have a chance to win a $50 gift voucher from Simon Says Stamp. You have until Monday 8am Ohio time. 1pm UK time, 2 pm CET to join in. If you want to, follow Simon Says Stamp on Instagram, they post great stuff daily. If you use instagram add #sssmchallenge to your challenge entry uploads, so that we can see them on there too. Don't miss that we have a Design Team call at the Simon Says Stamp Monday Challenge Blog, you can read all about it here. Beautiful and very inspirational wintery canvas!!! I love it!!! Beautiful canvas, Anna. My favorite colors and I love the fence. Such a gorgeous piece, Anna-Karin. I love how you created a wonderful winter scene. It almost fluctuates back and forth between beach and winter when I look at it. 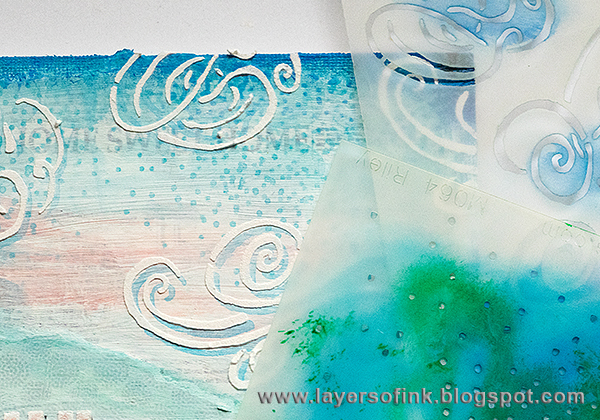 The swirl stencils are perfect, and the colors are soft, gorgeous, winter colors. I love this, it it such a dreamy winter scene. The ladder as a fence is a brilliant touch with the "snow" on it. Lovely! It was so nice to see each step of this lovely creation. It really does speak to those cold winter mornings with just a blush of color in the sky. I like the sentiments you used, too. This canvas is breathtaking! The scene looks soooooooo beautiful...WOW! Anna-Karin, this project is extraordinaire!! I enjoyed reading each step! 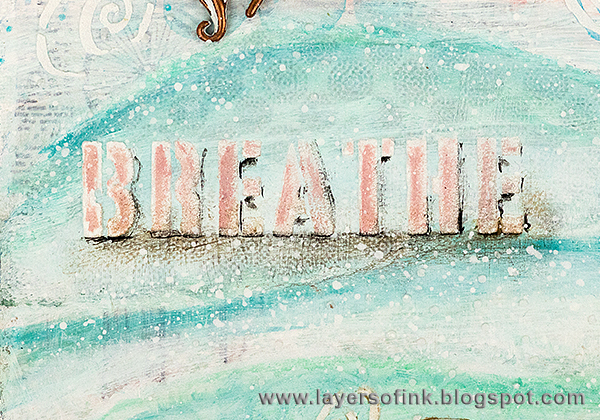 Also I love the subtle "Breathe" stenciled word! So so awesome! Amazing Alert! Amazing Alert! So impressed just on how you did that fence alone! Wow! And the whole scene has such a refreshing rejuvenating feel. Love this one! what a beautiful piece !!!! 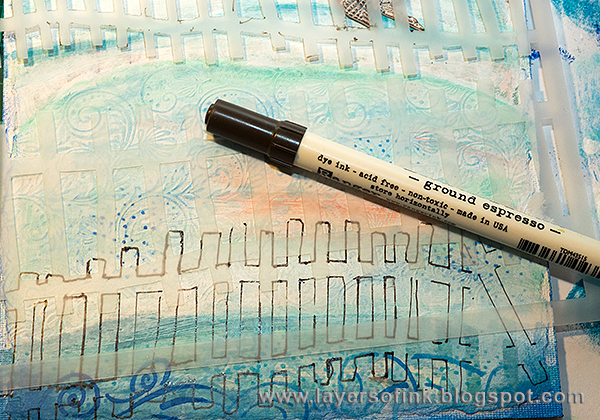 love the tip with the use of distress marker outline! !